From the onset of Rango, our yet unnamed chameleon posits a simple question as he analyzes the confines of his terrarium – who am I? Only until he finds himself in the small town of Dirt does he realize that his identity can take a new form. Through dumb luck, Rango takes the sheriff’s post, wherein he attempts to fulfill a duty to both himself and the townspeople. There’s strangeness to Rango that sets it apart from most contemporary animated films. Whereas most non-Pixar animated films depend on pop culture references to get its jokes by, most of Rango depend on a different source of reference. There’s appreciation to Western iconography and the thematic qualities of Leone Westerns. Rango also borrows heavily from films like Chinatown and McCabe & Mrs. Miller. And through its referential nature, Rango becomes something entirely unique in its own right. The visual production design adds to a lot of its distinctiveness – characters are dirt-covered, never really cute, and sometimes revolting. But above all, Rango entertains ideas that, while not fully realized, are new to contemporary American animation. How many animated films have tested a character’s ambition by lifting Chinatown’s narrative arch? Or had characters go on spiritual quests as they search for their identity? 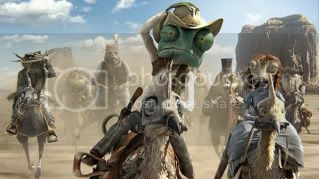 Rango offers something different – a genuinely thrilling film in theaters that is especially rare in the early months of the year.